This festive month, expect a rustic gastronomic delight at Element Kuala Lumpur. Situated on the 40th floor, TRACE restaurant and bar proudly presents ‘Dari Dapur Bonda’ dinner buffet. Executive Chef Man and his culinary team brings you that balik kampung nostalgia with popular classics that is sure to please your cravings. Guests can soak in the magnificent city views while they whet their appetite with refreshing greens and local salad such as Fresh Mango Salad with Eggs, Fresh Papaya Salad with Smoked Meat and Fresh Mango Salad with Seafood (Kerabu Telur dengan Manga Muda, Kerabu Betik dengan Daging Salai & Kerabu Lautan). For the extra oomph in your taste buds, head over to the Satay Corner for Chicken, Lamb and Beef Satay with signature TRACE peanut sauce. A must-try from the menu include Ikan Sembilang Salai with Pucuk Ubi, Rendang Daging Minang, Nasi Hujan Panas, Bubur Lambuk, whole roasted chicken and lamb, also not forgetting Chef’s lemang and ketupat. 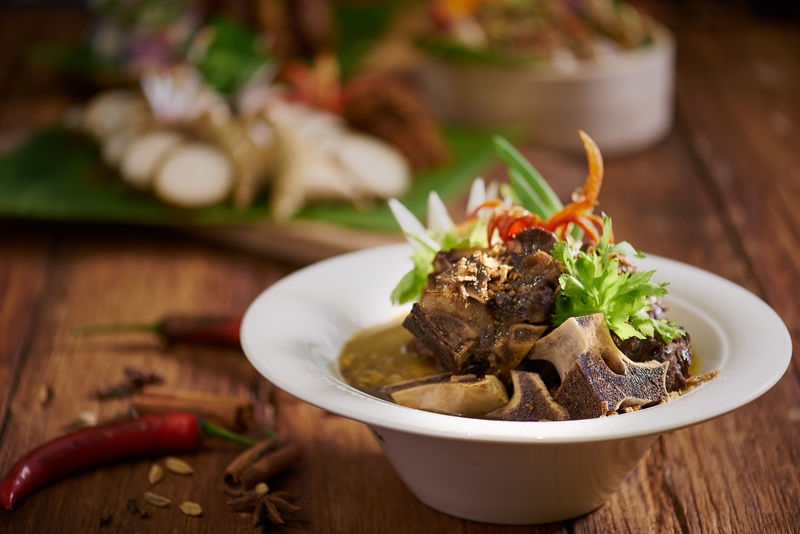 A classic all-time favourite dish on the list is the Sup Gear Box – this remarkably flavourful soup is made out of beef bone marrow with our Chef’s signature spices and seasoning. The thick and tasty texture promises to be an absolute delight leading a spoonful to consequent spoons after spoonfuls. Dari Dapur Bonda showcases an extensive selection of local Malay cuisine that can be traced back to the Chef’s kampung and offers a bountiful selection of home-cooked goodness for a truly memorable sky dining experience. Guests can round up the culinary journey at the sweet corner and be spoilt for choices by the vast variety of dessert. The dessert corner features a range of popular Malay kuih as well as Marble cheese cake, Pandan layer cake, Strawberry short cake trifle and plenty more. These dishes will vary each day throughout the whole month to ensure guests enjoy a wholesome buffet. At the end of the buffet, guests can bring home a package of Sambal Goreng Bonda, prepared to perfection as a bespoke giveaway to replicate Chef’s signature dishes at home. Priced at RM 158.00 nett per Adult & RM 69.00 nett per Child, the Dari Dapur Bonda Buffet promotion will be available from 6.00pm to 10.30pm at TRACE restaurant and bar, from 18th May – 14th June 2018. Early bird offer is priced at RM 98.00nett per person from 10th April – 7th May. All Maybank, HSBC, Citibank, Affin and UOB credit card members are entitled to 30% discount throughout the festive period.